WASHINGTON — Steve Bannon and his allies don't have to win every battle in their guerrilla war to take down the Republican political establishment. They just have to wreak enough havoc to alter the behavior of GOP lawmakers. And that's what Bannon, the former chief White House strategist and campaign manager for Donald Trump, is promising to do in the corridors of Washington power and on the electoral map. His core argument: Senate Majority Leader Mitch McConnell, R-Ky., and establishment-minded Republican members of Congress are thwarting President Donald Trump's agenda through a combination of sabotage and incompetence. Conservative voters should both demand a change in Senate GOP leadership and use primary elections to oust Republicans who aren't in lock step with Trump, the anti-establishment Republicans contend. Bannon's aggressive strategy and tactics — including a full assault on McConnell and securing the financial backing of mega-donors— have given new urgency to the insurgency. "The battle royale between Trump and the base vs. McConnell and the establishment is upon us," said David Bozell, president of For America, one of several conservative activist groups that share Bannon's goals. "It's just going to get hotter and hotter and hotter," added Bozell, who last week called on McConnell and his team to resign from Senate leadership. "The litmus test is — whether you're an incumbent or a challenger — we’re looking to see who's going to support Mitch McConnell or not. If you're going to support Mitch McConnell and this leadership team, there's not going to be an appetite for you." The fight between the wings of the Republican Party has been raging since long before Bannon became a familiar figure on the national political scene last year. It coincided with the rise of the Tea Party in the 2010 election cycle and intensified with Trump's defeat of a legion of GOP current and former officeholders in the 2016 presidential primary. "Right now, it's a season of war against the GOP establishment," Bannon, the head of the conservative Breitbart media outlet, said Saturday at the Values Voter Summit in Washington, D.C.
Ken Cuccinelli, president of the Senate Conservatives Fund (SCF), which has spent millions of dollars to help elect conservatives such as Sens. Ted Cruz, R-Texas, Mike Lee, R-Utah, and Pat Toomey, R-Penn., said he’s told his staff that they don’t have to win every race to change the way Washington operates. He'll be thrilled "if we bat .400," he said. If they can beat a few establishment candidates at the ballot box, the thinking goes, they should be able to beat the rest into submission when it comes to fully supporting Trump's agenda. Bannon already has one high-profile win: He backed conservative firebrand Roy Moore, who ousted incumbent Sen. Luther Strange last month in a landslide victory in the Republican primary in the Alabama Senate race to fill Jeff Sessions' seat. The victory came despite Trump's support for Strange and the main McConnell-linked super PAC spending millions of dollars to help Strange. Alabama was a major wake-up call to other Republican candidates slated to run in 2018. Bannon has encouraged Erik Prince, the founder of now defunct private security and military firm, Blackwater, to run against Sen. John Barrasso in Wyoming, according to The New York Times. A spokesperson for Prince declined to comment. Rep. Dave Brat, R-Va., who upset then-House Majority Leader Eric Cantor in a 2014 primary, said Senate Republicans who signed onto the GOP platform and haven’t helped deliver are "fair game." "They should be challenged for not keeping their word," he said. And while Bannon has focused mostly on the Senate so far, he is backing former Rep. Michael Grimm, R-N.Y., who is seeking to regain his House seat after serving prison time for a felony tax fraud conviction. Even though Bannon and Trump found themselves on opposite sides of the Alabama race, he isn't trying to stick it to his old boss, said Rick Tyler, a Republican strategist and MSNBC political analyst. "Bannon believes in his world view and is driven by an ideological purity," Tyler said. "With the support of Moore in the Alabama race, he demonstrated a pro-ideology play rather than an anti-Trump play." 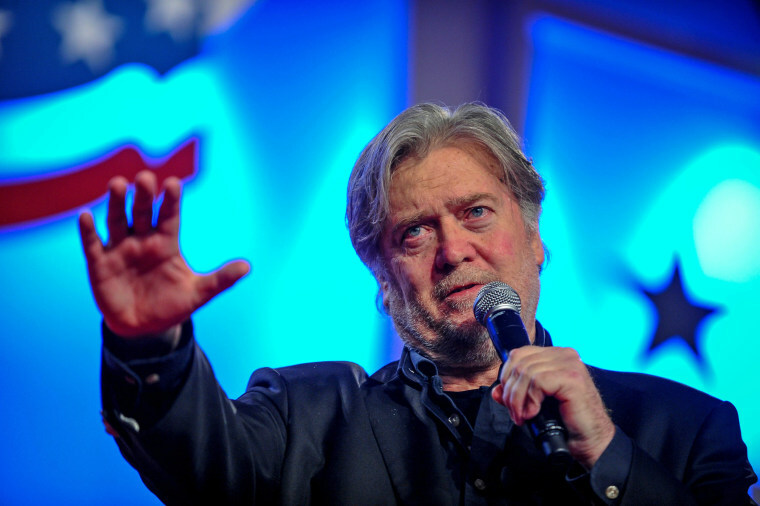 Rather than splitting with Trump, Bannon is trying to get Republicans to fall in line with the populist, nationalist agenda the president outlined on the campaign trail, which included pulling back on trade deals, repealing Obamacare and cracking down on immigration. But his primary focus right now is getting rid of McConnell. Some in the political establishment say Bannon's skills and clout are greatly exaggerated. "The idea that you would be afraid of Steve Bannon is just laughable," said Stuart Stevens, who helped Mississippi Sen. Thad Cochran beat back a challenge from anti-establishment Republican Chris McDaniel in 2014. Bannon doesn't have a long record of winning statewide races, said Stevens, who has advised incumbents to tell the story of what they’ve done for their constituents and force opponents to defend their own positions rather than allowing them to just attack Washington. Those strategic tips are likely to be tested — and soon. Of the seven Republican senators up for re-election in 2018, only Cruz can rest easy that Bannon isn't coming after him. Sen. Bob Corker, R-Tenn., who was likely to face a stiff primary challenge of the Bannon-backed variety, announced last month that he won't seek another term. And there's little doubt that other groups would have been ready to back an oust-Corker effort because the senator has threatened to derail the president's tax reform plan over deficit concerns. These groups don't believe that conservative candidates are likelier to lose to Democrats in a general election. Instead, they think the real danger is that the grassroots will stay home if Republicans nominate establishment candidates. For America and SCF are operating on parallel tracks with Bannon, their leaders told NBC. "We have similar ultimate goals," Cuccinelli said. But it is Bannon who has taken point, and he's done so with the backing of Robert Mercer, who made his billions through the legendary Wall Street hedge fund Renaissance Technologies. Mercer emerged as one of the largest single donors for Trump, pumping more than $15 million into a super PAC that helped Trump. Bannon, a close ally of the Mercer family, will back 15 anti-establishment Senate candidates — including some Republicans seeking nominations to take down Democratic incumbents — and he's conditioning his support on candidates agreeing not to vote for McConnell as majority leader, according to Bloomberg Politics. Without the Mercer money, Stevens said, there isn't "any legitimacy to considering Bannon anything but just another weird guy on television." Bannon has broadly criticized McConnell's leadership, lack of support for Trump and the Senate’s failure to repeal Obamacare, and he went after the Kentucky Republican directly on Saturday at the Values Voter gathering in D.C. Noting that he was speaking metaphorically, Bannon likened McConnell to Julius Caesar, who was stabbed to death by Roman senators, including his old friend, Brutus. McConnell's critics, Bannon said, are now wondering: "Who's going to be Brutus to your Julius Caesar?" Jonathan Allen reported from Washington and Keri Geiger from New York.